Indulge in this delicious, nutritious, filling, and dare I say amazing treat of a smoothie! All the credit for this fabulous recipe goes to Ana, a fellow smoothie enthusiast, and chocolate lover. While exchanging emails about smoothies, chocolate, and good food she was kind enough to share this recipe with me, and now the smoothie world. She even supplied the beautiful image to the right. Thanks, Ana! This dreamy smoothie is similar to the one’s I make for breakfast. It’s loaded with nutrition and macronutrients to keep you full of energy and satiated until lunch. There’s plenty of healthy fat, ample protein, and it’s low in sugar – a winning combo in my book. The blueberries and superfoods offer some fantastic health benefits. In short, you’re getting a huge dose of antioxidants and a plethora of vitamins and minerals that will boost your immune system, feed your brain, increase your energy, and put you in a good mood. This smoothie is higher in calories than most of my recipes. As mentioned above it’s very satiating and the type of large breakfast active people like myself require. If you’re looking to reduce the calories, forgo the Brazil nuts (93 calories for just 3 of these guys) and possibly the protein powder. I used Sun Warrior’s Warrior Blend, which clocks in at about 84 calories a serving. You can also use water in place of milk. If you’re counting calories, I encourage you to try a smoothie like this and see how you feel. You might be surprised at how satiated you are and less likely to reach for a sugary snack or consume a large lunch. Ana and I both like to toss everything but the kitchen sink into our blenders. If you don’t have every ingredient listed below, use what’s available and don’t sweat it. Enjoy! 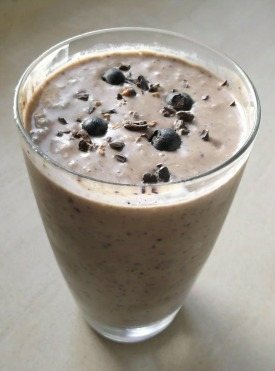 Ana and I would love to know if you try this blueberry chocolate dream smoothie – please leave a comment below. Happy Blending! Hi, I’m trying to lose some weight. I live in Nigeria. Just discovered this site. Will try to use the stuff I find. What are the basic components of a healthy smoothie? Brazil nuts – substitute almond or cashews or simply omit. cacao powder – this is raw chocolate powder, you might know it by cocoa. cacao nibs – raw chocolate chunks. maca – energy boosting superfood, you could go without. lucuma – omit, but you might want to add a little honey or maple syrup to sweeten. The only ingredient you really need is the cacao. Here’s my article on it for more info and where to buy. Also my article on maca if you’re interested. Wow… 30 grams of fat in one smoothie??!!! I usually eat around 20-25 grams of fat per day. Eating low fat/low sugar is how I lost 185 lbs and have kept it off for 5 years. Can I substitute coconut yoghurt for the dairy version? I swim most mornings (early) and need a smoothie that fills me up. This looks great, or would you recommend an oat based smoothie as I exercise some evenings. I am having problems getting my breakfast right! Sure you can substitute coconut yogurt for the dairy, Kirsten. This smoothie is pretty dense and filling; so it should keep you satiated. You could try an oat based one as well for a comparison. I tried the Chocolate Oat Smoothie this morning; It was delicious! I shall try this one tomorrow!